Published by breathmint on December 29, 2015 in Concert Recordings, FLAC and mp3. 3 Comments Tags: Neutral Milk Hotel, Petaluma, Robert Schneider. 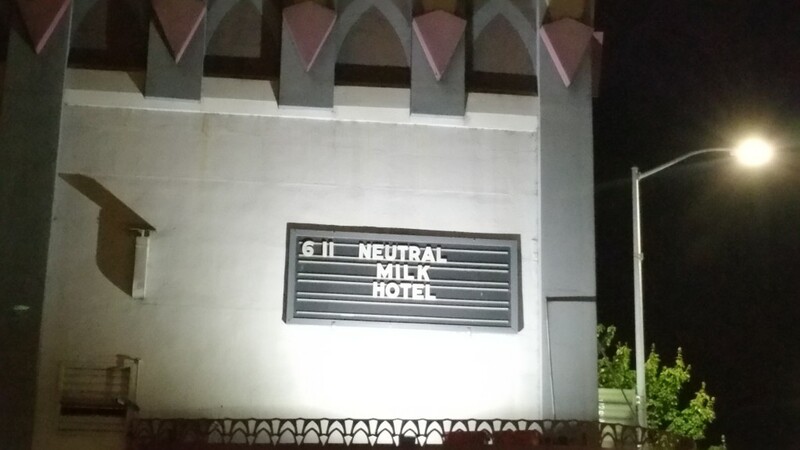 Here is my recording of Neutral Milk Hotel playing Phoenix Theatre, Petaluma, CA on June 11, 2015. Overall I would rate the quality as excellent, with the only issues being faithfully representative of the sound that night. I will seed the partial Robert Schneider recording sometime in the future. In the mean time please enjoy this second source for the last Neutral Milk Hotel gig “for the foreseeable future.” Recording notes and details follow the download links below. I offer up no apologies for taking a while on seeding this. 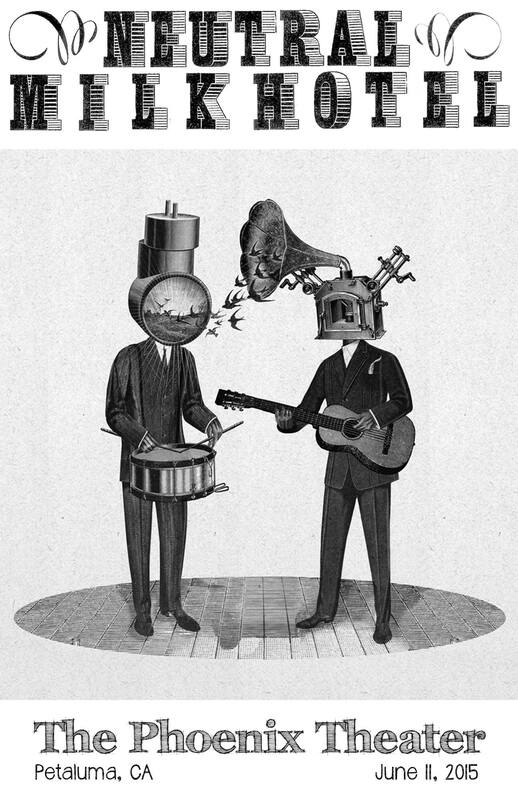 A recording of this show popped up nearly instantly after Neutral Milk Hotel delivered what may well have been their final show. To the best of my knowledge that recording is anonymous but was seeded by the user BLG in multiple formats and locations around the web. It’s a great quality recording, but it does have a few drawbacks in my opinion. Namely the crowd noise is pretty hefty – it sounds like the taper was right up in front. The vocals and high frequency content are also slightly drowned out. I hadn’t been to this venue before but guessed over-powering bass might be an issue and preemptively enabled the filter on my battery box. That turned out to be a pretty good decision. I also recorded about the second half or so of opener Robert Schneider’s set, which allowed me to get a decent level check and set prior to NMH taking stage. A few moments of 0 dB clipping occurred due to some heartfelt applause which I have cleaned up in this master. I was seated in the front row of the balcony, dead center. Thanks to the prime location, the filter, and 24/96 recording I am very pleased with this recording. I accidentally stopped recording just at the completion of In The Aeroplane Over The Sea (at 3:09). I missed about 10 seconds, but to gracefully mask this I have spliced in 25 seconds worth of audio from the other (anonymous) recording of this show which was originally seeded by BLG. Thanks for sharing! *I accidentally stopped recording just at the completion of In The Aeroplane Over The Sea (3:09). I missed about 10 seconds, but to gracefully mask this I have spliced in 25 seconds worth of audio from the other (anonymous) recording of this show which was originally seeded by BLG. Thanks for sharing! DO NOT: CONVERT THIS RECORDING TO ANY LOSSY FORMATS (mp3 link below) !! !